In my last post, I showed you the hardest parts of TOEFL Reading, based on feedback I’ve gotten from my students. Next up: TOEFL Listening. Like the last post, this list of hard parts comes directly from my students. Over the years, the TOEFL students I teach have given me lots of helpful feedback on what’s most challenging in this exam. The conversations, lectures, and class discussions in TOEFL Listening are five minutes long, and packed with information. Professors give detailed lectures on academic subjects, while students and university faculty discuss complicated aspects of student life. Keeping up with all of this is a challenge for many test-takers. Five minutes is short enough that it’s easy to miss a key point, yet long enough that it’s also easy to get completely lost as you try to keep up. Here on our blog, Kate Hardin offers good advice for hearing the important information and maintaining good pacing for TOEFL Listening. The speech in TOEFL Listening is sloppy, in the same natural way that real English speaking is sloppy. TOEFL speakers use contracted forms such as “y’know,” “gotta,” and so on. And speakers will sometimes mis-speak, saying something that is incorrect, and then correcting themselves. This is especially true in the lecture audio tracks. So you can easily hear a professor say something that isn’t true, something that’s the wrong answer on a question. 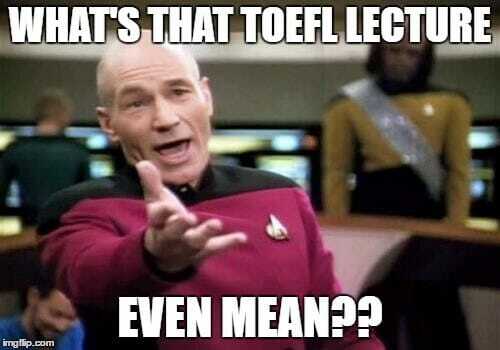 Many TOEFL preppers focus so much on formal academic speech that they aren’t ready for the informal nature of TOEFL Listening. Be sure to include some authentically informal English speech– the kind found in TED Talks, movies, and TV— in your TOEFL Listening Practice. In the TOEFL Listening section, certain questions play back a part of the audio you just listened to. Although it’s certainly helpful to get to hear a part of the lecture a second time, these playback questions aren’t as easy as you might think. Questions about the speaker’s suggestions and implications are called inference questions. Questions about why the speaker says something and what the speaker is trying to do are called function questions or purpose questions. Make sure you truly understand these two especially hard question types. Kate gives a good explanation of TOEFL Listening inference questions and function questions here on the blog. So what’s the hardest in Speaking and Writing? Because they include Integrated Tasks, TOEFL Speaking and Writing requires English reading and listening skills. And of course, these sections also require productive skills— the ability to actually produce language. As a result, these two sections have a longer and more complex list of “hard parts.” I’ve gotten a lot of great feedback from students on what’s most challenging about the second half of the TOEFL exam. I’ll share my students’ observations with you in the next two posts.